In my last post, I promised to explain my distrust of the way the media portrays the asylum seeker ‘issue’. A week is a long time in the blogosphere. Since writing this post, this so called ‘issue’ has been front page news as the government tries to reach a compromise, with the aim of reducing deaths at sea. I liked Jonathan Green’s article on the drum: Crying shame: tabloid cynicism over asylum seekers, as it was a satisfactory summary of how the mainstream media flips from one position to another (hatred to sympathy), with no acknowledgement of the anti-government impulse that drives the change. I also liked Malcolm Fraser’s opinion piece in the SMH a couple of weeks ago, which laid out the bare facts about asylum seekers, facts completely absent in the mainstream media. So if off-shore processing, particularly the Malaysian Solution, does discourage refugees from getting on a rickety old boat and risking their lives across treacherous seas to make it to Australia, maybe it’s an incremental improvement worth aiming for. 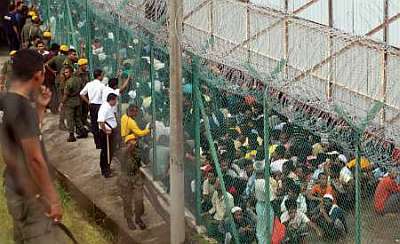 No doubt life in Malaysia, or Nauru for that matter, will be a nightmare for these refugees. But at least they will be alive, and not watching their family drown. This is the horrible compromise we are left with. I’m also very keen on the clause within the Malaysian Solution that binds Australia to the promise of accepting 4,000 refugees a year from squalid Malaysian refugee camps. These are the people who don’t have two cents to rub together, let alone enough money to pay a people smuggler. Surely these are the people who need our help most? Compromising an ideal solution, for a lesser solution that is an improvement on what is happening currently, is not an easy decision. It’s the grey between the two extremes of the Liberals’ black – ‘turn back the boats’ – and the Greens’ white utopian universe – ‘quick onshore processing with no mandatory detention’. It’s incredibly difficult for Gillard and her colleagues to make the tough calls that come with running a minority government in the current media landscape. Everything Gillard does is reported negatively, which makes it even harder for her to compromise. Look what happened when she compromised with the Greens to bring in the Carbon Tax. The best journalists painted this decision as ‘weak’, the worst have labeled her a ‘liar’ ever since. But if saving the planet, and saving refugees from death by drowning is all about the art of compromise, maybe it’s time the mainstream media painted compromise as an achievement, rather than a fatal flaw. Excellent article. A breath of fresh air in the current toxic partisan politics. Minority government requires a commitment to act in the Nation’s best interests, which requires a degree of compromise if we are to get anywhere. But we don’t get to throw away the human rights of one small group of scapegoats in the guise of saving the scapegoats. There is no stalemate, the refugee convention is binding law and always will be.